This big bass was near a school of bluegills and couldn’t resist a spinnerbait fished slowly through the bluegills. From now until the water gets hard again, if you want to be more successful in your fishing, there is one very basic thing to keep in mind: You’ve got to be fishing where your quarries’ food is. Actually, as soon as the spawn was over finding what the fish wanted to eat was a very important consideration. As the summer progresses and we get into the fall months, staying near what the fish want to eat is very important. Following are some examples and how you can capitalize when you encounter some of these situations. Let’s say you’re on a body of water that has lots of white bass. White bass are fun to catch: They’re great fighters and when they’re on the bite, they’ll eat almost anything you throw to them. Let’s say you’re trolling with crankbaits for white bass. Crankbaits in the smaller sizes are often very good for whites. Suddenly you notice lots of gulls diving in a certain area just a couple of hundred yards away. 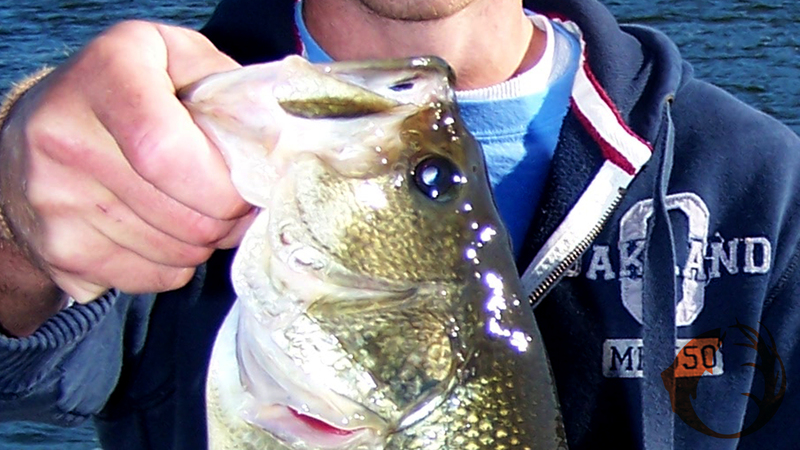 If you want to catch fish, you should get over to that area quickly but quietly. What’s happening is a school of white bass has trapped a school of baitfish, probably shad, near the surface of the water. The white bass are eating the shad from below, the gulls are eating the shad from above. Get within casting range and throw a bait that appeals to a white bass and you’re going to get bit. However, we’re not going to use that crankbait that we were trolling with. It will probably run under the bass. We want to choose a bait that can be fished on the surface or very close to the surface, something like a topwater bait or a Thumper Jig tipped with an Impulse Swim’N Grub in the two or three inch size. My first choice would be the Thumper/Impulse combo. A topwater would work, but they have treble hooks so it takes longer to unhook the fish. Also, white bass like to flop, and a flopping fish and treble hooks can be hard on fingers and hands. A few years ago I was fishing with Travis Peterson. Travis is an expert angler for any fish that swims near his home in Bemidji, Minnesota. On this day we were fishing bass in shallow vegetation. Fishing was pretty good. Travis then noticed that a dragonfly hatch was going on in a field of lily-pads nearby. We got over there quickly, but again, quietly. Every now and then we would see a bass slurp a dragonfly off the surface. We tied on Jaw-Breaker weedless spoons and started throwing them around. What had been good fishing changed to great fishing. The presence of the dragonflies got the bass into a feeding frenzy and we took advantage of it. If Travis hadn’t noticed the dragonfly activity however, we could have missed out on the action. If walleyes are your goal, pay close attention to your sonar for the presence of baitfish. You usually won’t see the surface activity with walleyes that you might with bass, but locating the walleye’s food is just as important to catching them as it is to white bass or largemouth bass. Something like the Raymarine Dragonfly 7 provides a very detailed picture of the bottom and reveals if baitfish are present or not. The Dragonfly 7 is a lot of sonar for not too much money. This time of year, if I don’t see baitfish when I’m fishing for walleyes, I usually don’t fish the spot. However, if the wind is blowing onto a point or shallow water structure, you might want to make a few casts to see if the fish are feeding shallow. Remember that during the summer and fall months if you want to catch fish, you’ve got to be fishing where their food is. If you remember that, your chances for success will go way up.